Siesta Key is one of the best spots in Florida for a fun family vacation. Not only are there tons of things to do in Siesta Key for families, there is an endless number of rentals ideal for families of all sizes. As the industry leader in Siesta Key, Florida, vacation rentals, we are proud to help you plan a getaway you and your family will never forget! Here are 10 of our most popular rental options for families. This two bedroom, two bathroom rental is an ode to the class beach bungalow. You’re less than two minutes away from Siesta Key Beach and Siesta Key Village. Your kids will love taking advantage of our Adventure Tiki and all the exciting rental equipment. You also have your own private backyard for fun nights full of games and grilling. This rental has three bedrooms and three bathrooms to accommodate up to 10 people. Lounge on your private front patio or in your in-ground spa or heated pool. 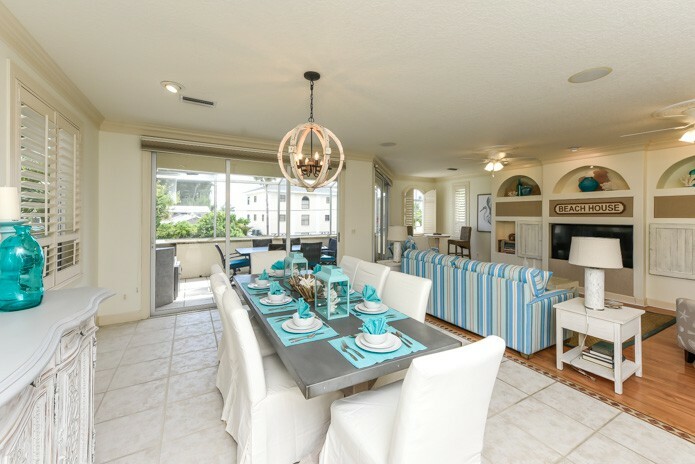 You’ll have a full kitchen to entertain and prepare meals, and you have free shuttle service throughout the Key, though some of the best free Siesta Key attractions are just a short walk away. Accommodating 13 people, Island Time East has three bedrooms and 2.5 bathrooms. This rental will make you feel right at home with the private game room and large garage. Amenities such as beach towels and WiFi are included, and you’re just minutes from all the incredible offerings of Siesta Key! Siesta Sun sleeps 10 people between three bedrooms and a large den. You also have 3.5 bathrooms, a full kitchen, and laundry facilities inside your rental. The private balcony gives gorgeous views, and you won’t want to miss the game room! You can easily walk or bike to the Village. Perfect for 8-10 people, this three bedroom, three bathroom rental is a quaint spot to relax at the end of long, sun-filled days. Lounge in your hot tub or watch the sunset from your screened lanai. This home has brand new tile and wood floors for you to enjoy, putting you in the lap of luxury. One of the best features of Private Beach House is, well, the private beach! 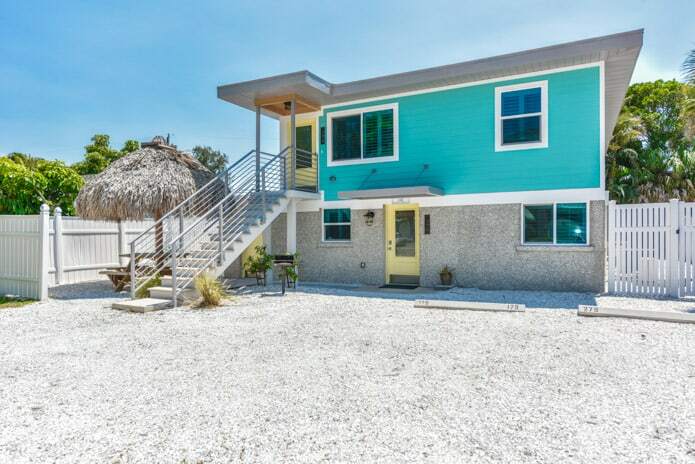 Your party of nine will adore this newly updated home, and you’re just seconds from the gorgeous shores of Siesta Key. Your rental includes two bedrooms, 2.5 bathrooms, a cozy living room, dining space, fully equipped kitchen, and convenient laundry facilities inside. 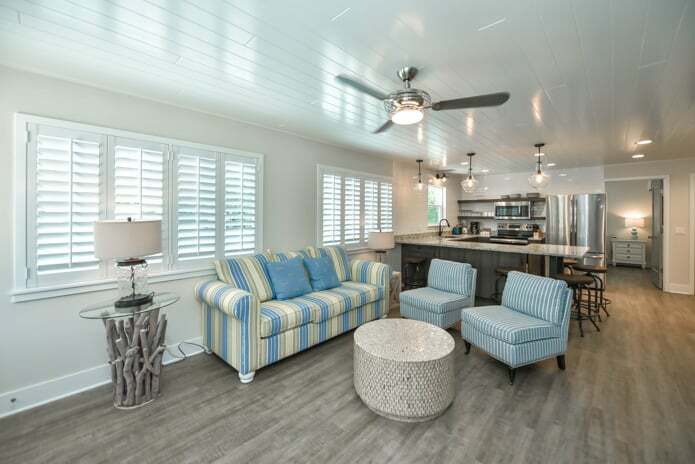 The Daiquiri Deck is a three bedroom, three bathroom unit that sleeps 10 people and is just steps away from the phenomenal Siesta Key Village. Beach equipment can be easily rented through our Adventure Tiki service, and our complimentary concierge is happy to let you in on the area’s hidden gems for food, shopping, nightlife, and more. Island Sun is ideal for 10 people with its three bedrooms and 2.5 bathrooms. You’ll have access to a heated pool and game room, and the beach and village are just blocks away. The living, dining, and kitchen spaces will help make this rental your home away from home. Fins Up sleeps 10 in its three bedrooms and has two bathrooms. You and your family will love the close proximity to beaches and the village with plenty of things to do on a family vacation. Easily get around the island by walking, biking, or taking the free trolley or free Siesta Key shuttle. Spend the evening grilling in the backyard or walk to one of the many nearby restaurants. Island Time West is a mirror image of Island Time East. It fits 13 people and is directly across from Siesta Key Village, just one block from the beach. For a larger party, rent both Island Time East and West to accommodate 26! Siesta Key offers endless possibilities for places to eat and things to see. We are proud to be the top rental company in the area and would love to help you plan your getaway. Contact us today for more information on our Siesta Key condo rentals, vacation homes, and our complimentary concierge service.